Your pulse rate is measured by the amount of times your heart beats per minute. A healthy pulse rate for adults ranges from 60 to 100 beats per minute. When a medical professional measures your pulse rate, they also measure your heart rhythm and pulse strength to better determine the overall health of your heart. 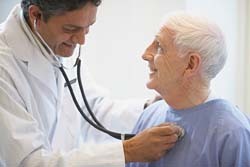 In fact, most physical exams and routine checkups include a reading of your pulse rate as a way to spot potential health problems like heart disease and diabetes. The medical professionals at FastMed Urgent Care want you healthy. All of our clinics are open 7 days a week, 365 days a year, and because we are community-based within North Carolina and Arizona, there is a FastMed location right in your neighborhood! Your Pulse Rate Is One of Your Body’s Vital Signs. Respiration rate. The number of breaths a person takes per minute. A normal respiration rate for an adult can range from 12 to 16 breaths per minute. Blood pressure. Although blood pressure is not technically a vital sign, most medical professionals will measure your blood pressure along with your temperature, respiration, and pulse rates. High blood pressure, also known as hypertension, can increase your risk of heart attack and stroke, so tracking your blood pressure is vital to your health and safety. Pulse rate. A pulse rate that is too fast (tachycardia) or too slow (bradycardia) can lead to serious health conditions if not properly managed. There is a reason we put “fast” in our name. Our medical clinic procedures make sure that you receive prompt medical attention without sacrificing quality. All of our clinics are equipped with on-site labs and X-rays, as well as employ only the highest caliber of medical professionals. Find a FastMed near you today, and feel better tomorrow!